Explanation: The central bulge of our Milky Way Galaxy rises over the northern Chilean Atacama altiplano in this postcard from planet Earth. At an altitude of 4500 metres, the strange beauty of the desolate landscape could almost belong to another world though. Brownish red and yellow tinted sulfuric patches lie along the whitish salt flat beaches of the Salar de Aguas Calientes region. In the distance along the Argentina border is the stratovolcano Lastarria, its peak at 5700 metres (19,000 feet). 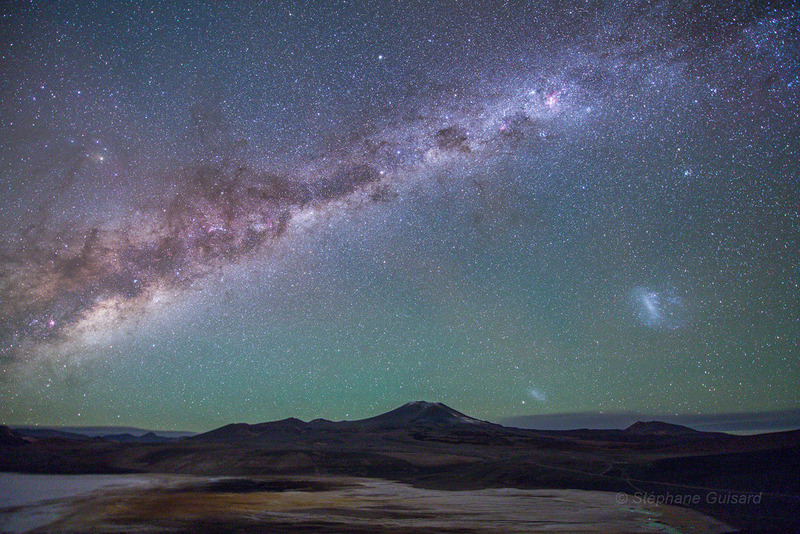 In the clear, dark sky above, stars, nebulae, and cosmic dust clouds in the Milky Way echo the colours of the altiplano at night. Extending the view across extragalactic space, the Large and Small Magellanic Clouds, satellite galaxies of the Milky Way, shine near the horizon through a faint greenish airglow.